Wow…. Body Worlds… what can I say? The words, “ew” and “wow” come to mind. It was both gross and awe inspiring at the same time. I had no idea what this exhibit was before I got there. I had just heard that it was awesome. So when we walked in, they have all these banners up and it says that everything is real bodies. I was like, “what? !” Yes, they are real bodies. Bodies that have been donated and then plastinated, posed and then voila. The idea, of course, is to give people a better understanding of the human body. Show them what incredible machines we are. And it does. They have skeletons with only the full capillary system. They pose the bodies into positions like “skating figure couple” so you can see the use of the muscles. I drew the line at the fetuses. Talk about making me not want to have a baby – they took out the heart of that process, if you know what I mean. They showed diseased organs, like cancer, cirrhosis, emphysema. They had this “I Quit” pledge to quit smoking. It was a plexiglass box and you could fill out a business card pledging to quit smoking. The box was almost full. On a brighter, happier note. I finished my final swap before I leave the country. 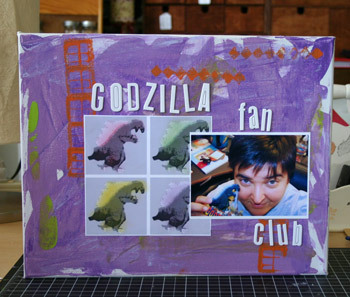 This is for our WCTP, Amber is in the Godzilla Fan Club, and we did altered canvases. This is me faking it with the painting. Listening to the Kooks lately. Love this album. Expecting my new clutch in the mail any day now. Very excited! James and I stopped at this place yesterday. Oh. My. God. This man is a genius!! He’s this very funny french man, who makes the most delicious, delectable chocolates I have ever tasted. Exotic flavors, no preservatives, so there’s no waxy flavor. The minimum amount of sugar, so it’s not to sickly sweet. I had Hibiscus, Kalamata Olive, Mint Ganache, and Apricot & Chili. OOOOOOOOHHH!!! So good And I have Japanese Green Tea, Pistachio and Lemon Mousse in the fridge calling me. The Weepies have a new CD out, Michelle. I never got to see the Bodies Exhibit when it was in Tampa. I am still regretting not going to see it. Yummy yummy clutch and chocolates. I think I like the clutch more. I must browse Etsy more! Finally, I almost finished with your layouts. I love them so much that I want to submit them for publication. My friend, Catherine Feegal-Erhardt (Memory Makers Master 2007) helped me to design the second one. I love love love them. I bought these great scrapbook frames at Michael’s and put your layouts in them. They are now hanging on my wall! I hope the rest of your weekend was a good one! chris and I went to the bodies exhibit a while ago. we knew that they were real, but he didn’t like it at all. I thought it was the coolest thing ever. He didn’t like it cause ,”there was once a soul in that body.” I’d go again. LOve the canvas very cute and I will be getting that new weepies album asap! Consider me the rotten apple but the truth must be revealed about the Bodies Exhibition- well, what’s believed to be the truth anyhow is that the bodies are actually those of executed criminals from China. They apparently never gave permission as it’s believed displaying bodies in such a manner would be detrimental to their afterlife. That’s how the exhibition is able to have such consistency with many multiple shows simultaneously throughout the world. SCANDAL! BTW- I’m sure I mentioned this on a few occasions but I will be smoke free for 17 months in July after 17 YEARS of smoking. Oh yeah, I have to add a disclaimer that the Bodies Exhibition scandal is not at all affiliated with the Body Worlds Exhibition. I would love to see the horse! !